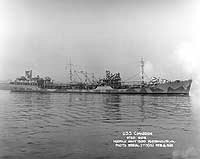 USS Cimarron, first of the Navy's many World War II era T-3 type oilers was built at Chester, Pennsylvania. 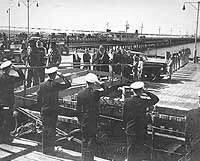 She went into commission in March 1939 and transported oil along the west coast and to Hawaii during her first year of service. 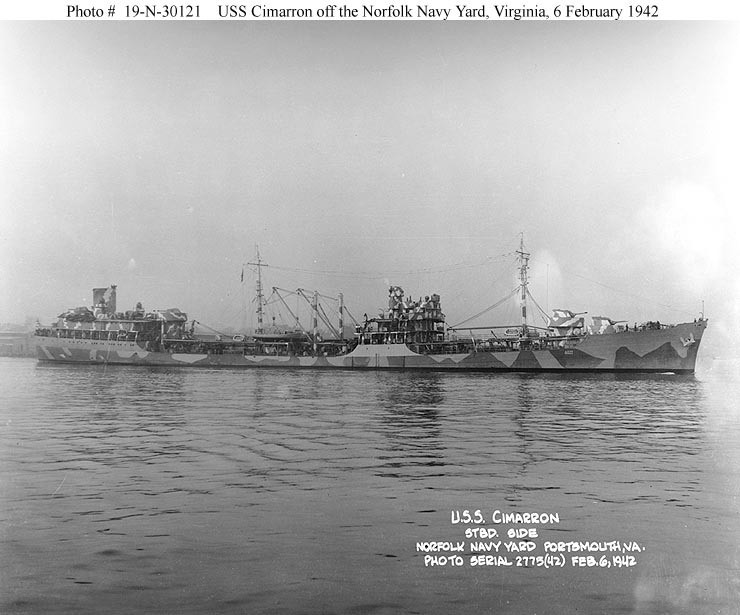 In mid-1940, Cimarron entered the Philadelphia Navy Yard to receive her armament and other features required for her intended combat support employment. Upon completion of this work in the Spring of 1941, she began operations in the Atlantic that lasted until March 1942, when she transited the Panama Canal to join the Pacific Fleet. 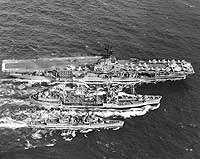 Cimarron's first Pacific war undertaking was to provide oil for the carriers and other ships involved in the April 1942 Doolittle Raid on Japan. In June she replenished ships taking part in the Battle of Midway. During the rest of 1942 and into 1943, the oiler took part in the Guadalcanal campaign and the early stages of the Central Solomons campaign. She spent the rest of the war supporting the advance across the central Pacific and up toward Japan. 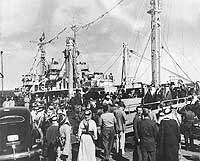 After the fighting stopped in August 1945, Cimarron remained in the Far East to assist with occupation efforts until early 1946. 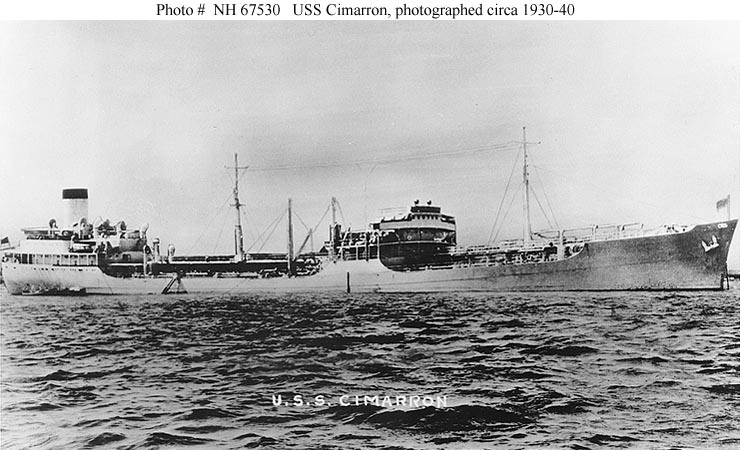 During the later 1940s, Cimarron transported oil from the Persian Gulf to the Pacific. She operated in Asiatic waters during the Korean War, making four deployments to the war zone in 1950-53. Following the end of that conflict, her pattern of regular trans-Pacific voyages to support the Seventh Fleet continued for some sixteen more years, including Vietnam War operations in 1965-68. Following nearly three decades of Navy service, during much of which she was the oldest ship on active duty, USS Cimarron was decommissioned in October 1968. She was sold for scrapping in 1969. 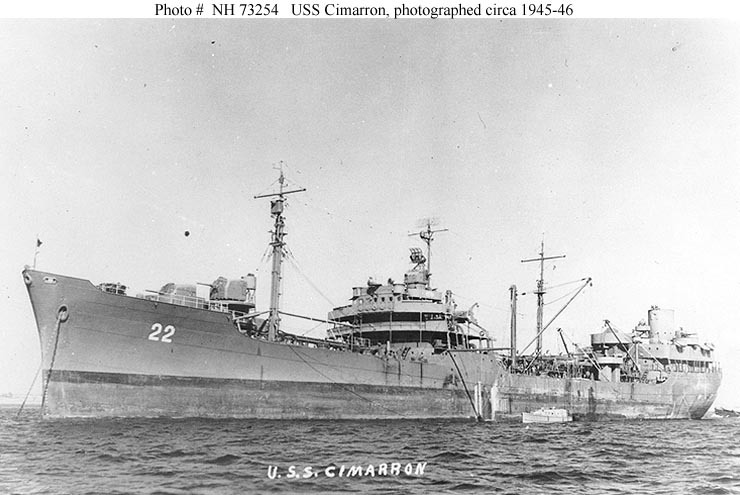 This page features all our views of USS Cimarron (AO-22). Photographed circa 1939-40, soon after completion and prior to receiving her armament. Courtesy of Donald M. McPherson, 1969. Off the Norfolk Navy Yard, Portsmouth, Virginia, 6 February 1942. Note her camouflage scheme, and hull number painted just below the forecastle break. Courtesy of Donald M. McPherson, 1970. Underway at sea, 16 November 1965. Photographed by PH3 G.S. Brown, of USS Kitty Hawk (CVA-63). Refueling from USS Cimarron (AO-22), during the Doolittle Raid operation. Photographed from USS Salt Lake City (CA-25). The original photo caption states that this view was taken on 18 April 1942, the day the Doolittle Raid aircraft were launched to attack targets in Japan. Note that Northampton's forward smokestack had been reduced in height by this time. 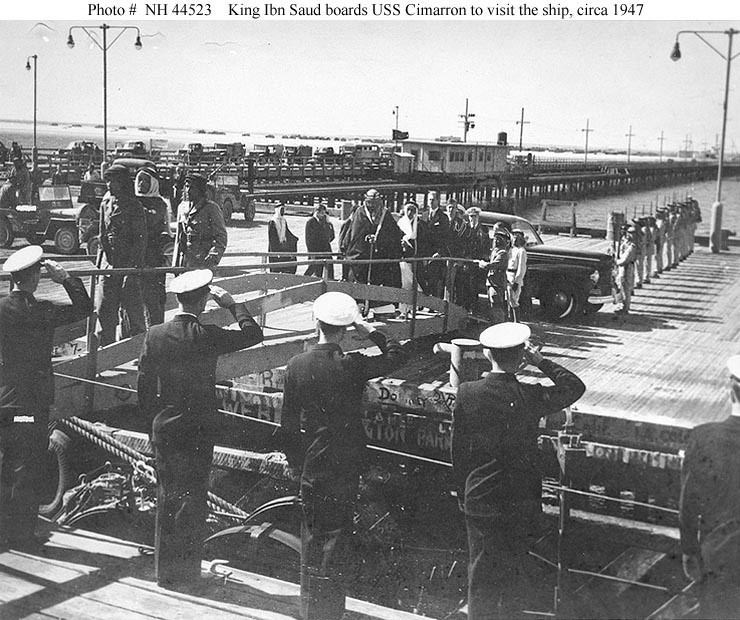 King Ibn Saud, of Saudi Arabia, boards the ship for a visit, probably near Dhahran, Saudi Arabia, circa 1947. He is preceded by some of his bodyguards and followed by Mohamed Effendi (interpreter), Waldo Bailey (U.S. Consul at Dhahran), Colonel William McNown (Military Attache to the U.S. Embassy in Cairo, Egypt), Captain John C. Woelfel (U.S. Naval Technical Officer at the Cairo Embassy), and Captain Dewitt C.E. Hamberger (Naval Attache to the Cairo Embassy). Some of Cimarron's officers are saluting in the foreground. 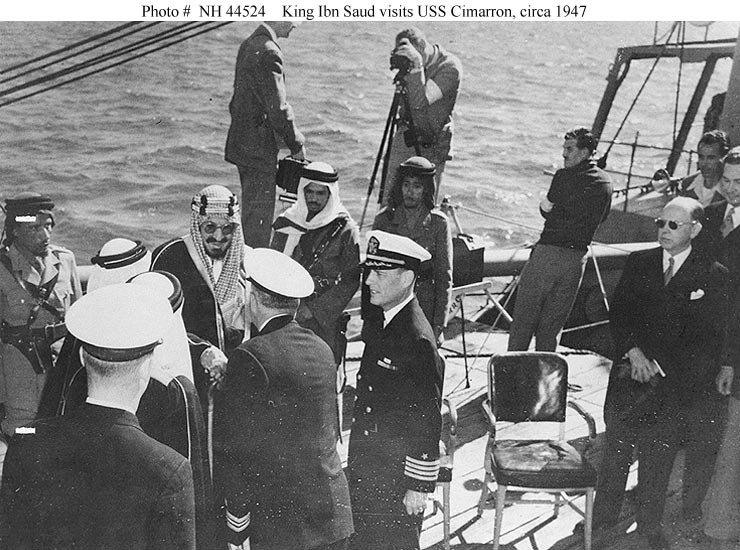 Captain John W. Murphy, ship's Commanding Officer, presents King Ibn Saud, of Saudi Arabia, to the Executive Officer, during a Royal visit on board, probably near Dhahran, Saudi Arabia, circa 1947. Some of the King's bodyguards are standing nearby, with photographers beyond. David Duncan of "Life" Magazine (with flash camera) is one of the latter. Standing at right are U.S. Minister to Saudi Arabia J. Rives Childs (in dark glasses) and Waldo Bailey, the U.S. Consul at Dhahran. 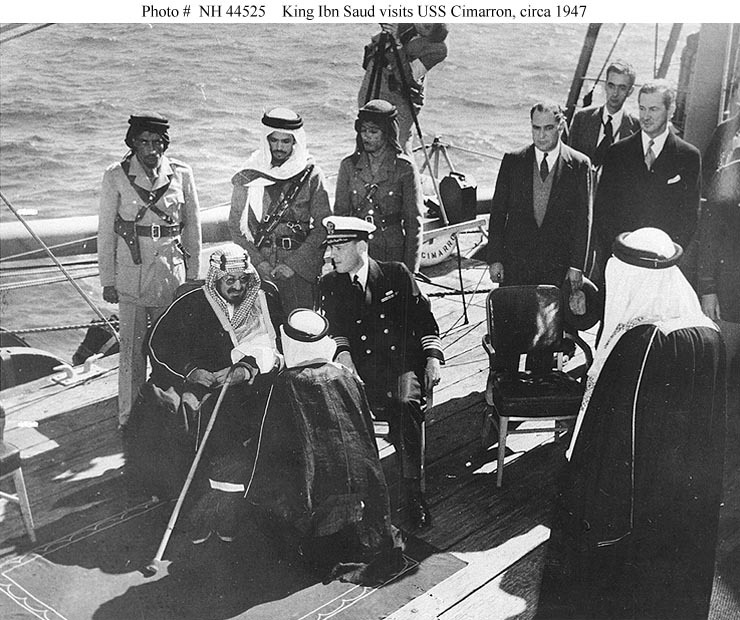 Captain John W. Murphy, ship's Commanding Officer, talks with King Ibn Saud, of Saudi Arabia, during a Royal visit on board, probably near Dhahran, Saudi Arabia, circa 1947. Interpreter Mohamed Effendi is between them. Some of the King's bodyguards are also present. At right are Ralph B. Curren (Civil Air Attache to the U.S. Embassy at Cairo, Egypt) and Waldo Bailey (U.S. Consul at Dhahran). 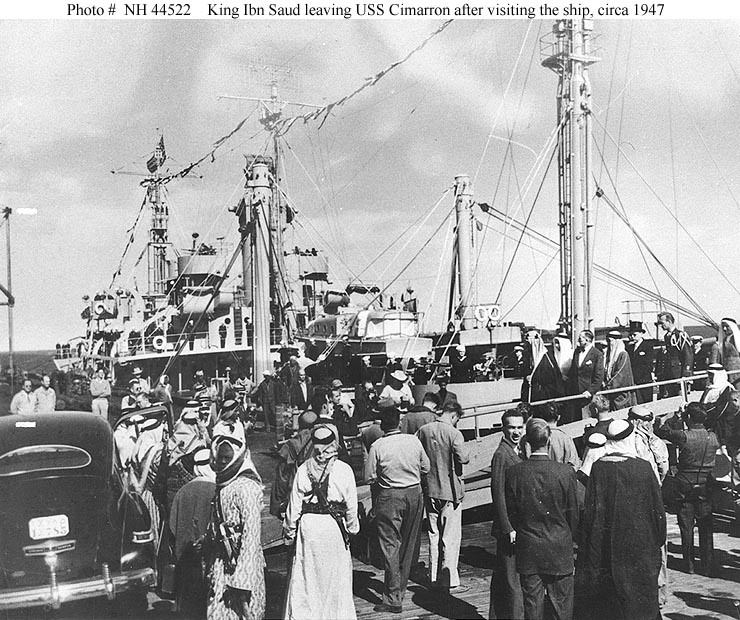 King Ibn Saud, of Saudi Arabia, leaving the ship after a visit on board, probably near Dhahran, Saudi Arabia, circa 1947. 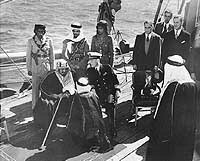 Following the King are Mohamed Effendi (interpreter), J. MacPherson (General Manager, Arabian-American Oil Company), unidentified Saudi, J. Rives Childs (U.S. Minister to Saudi Arabia), and Colonel William McNown (Military Attache to the U.S. Embassy in Cairo, Egypt). Note the photographers and bodyguards standing in the foreground. 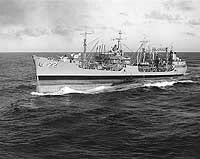 During underway replenishment activities off the coast of North Viet Nam, circa 1966. 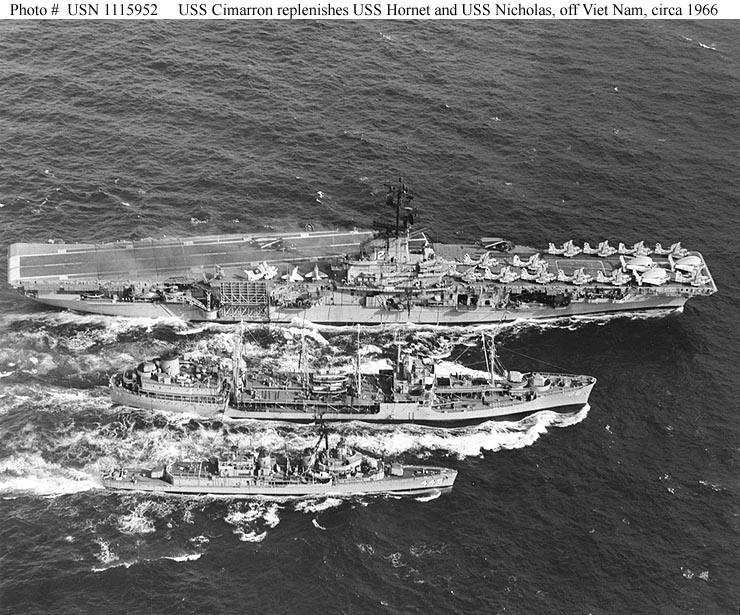 At that time these three ships had accumulated nearly 75 years of Navy service between them. Reproductions of this image may also be available through the National Archives photographic reproduction system as Photo # 428-N-1115952. DO NOT try to obtain them using the procedures described in our page "How to Obtain Photographic Reproductions." USS Cimarron (AO-22) at Pearl Harbor, May 1942. 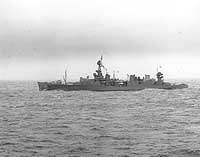 USS Cimarron (AO-22) underway off the coast of Korea, 17 November 1950. Photographed by R.A. Schreiber, Combat Photo Unit THREE. USS Cimarron (AO-22) steaming past USS Boxer (CVA-21), 1 June 1953. Port bow surface view, apparently taken from Boxer. 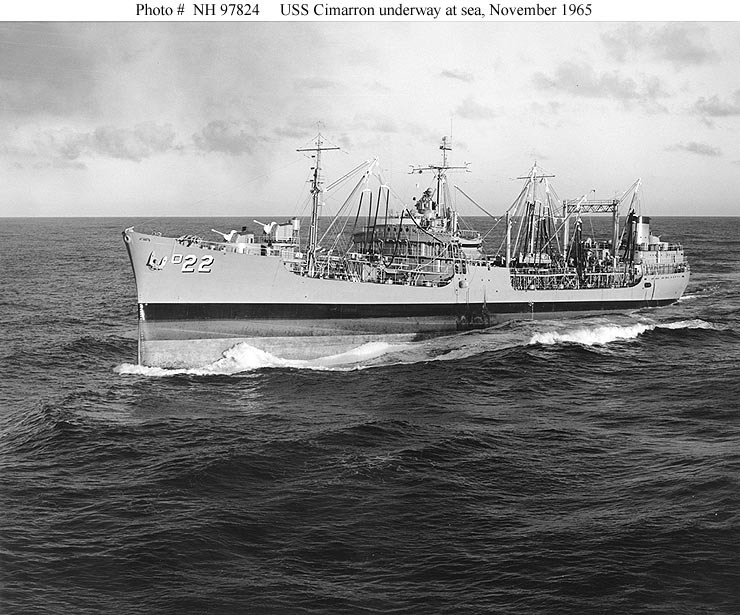 USS Cimarron (AO-22) underway at sea, 13 November 1953. Port broadside surface view, taken by W.L. Pooler, of USS Yorktown (CVA-10). USS Cimarron (AO-22) moored along the starboard side of civilian tanker National Defender (described as "World's largest tanker, 810 feet in length"), offloading fuel at Echo Anchorage in Tokyo Bay, Japan, July 1960. Three YOs (fuel oil barges, self-propelled) are moored on National Defender's port side. National Defender was then operating under contract with the Military Sea Transportation Service (MSTS). Photographer: Piotrowski. Aerial view from directly off the ships' bows. 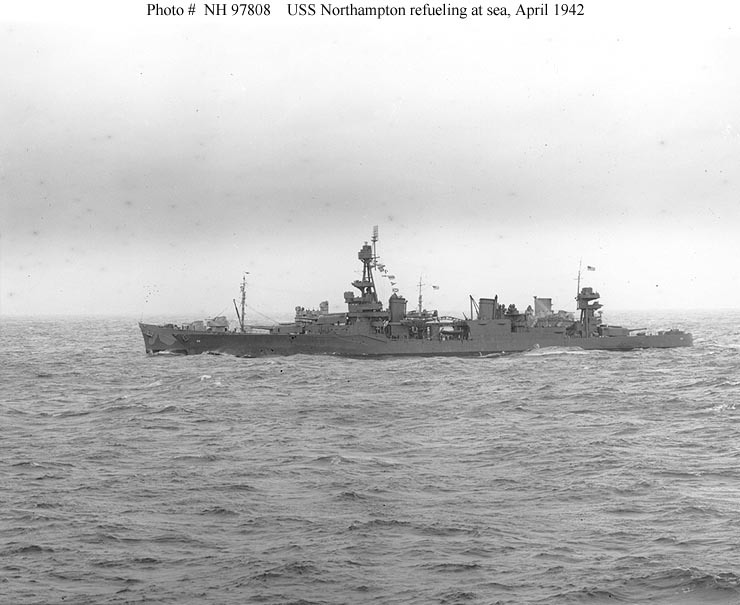 As in USN 1049912, but taken from directly off the ships' sterns. As in USN 1049912, but taken from directly off the ships' port bows. USS Cimarron (AO-22) steams alongside USS Bon Homme Richard (CVA-31) off the coast of California, 26 August 1963. Port bow aerial view, fairly tight on the bow. As in USN 1093936, but angle of view is more to the ship's port side. As in USN 1093936, but photographer is PH2 Marvin M. Pierce. As in Navy KN-7248, but angle of view is more to the ship's port side. The images listed in this box are NOT in the Naval Historical Center's collections. DO NOT try to obtain them using the procedures described in our page "How to Obtain Photographic Reproductions."